Have you been inspired to do some fundraising of your own for Khushi? If you have, get in touch with us and tell us all about your fundraising idea. Once you have done your fundraising, let us know what you did and how much you raised and (however old or young you are) you will be sent your very own Blue Footprint Award from Khushi the Cow. We look forward to hearing from you soon. Please note: if you are planning on doing a sponsored event, you can download a sponsorship form here (available soon). Alternatively, you can set up your own fundraising page or event via our online giving page. 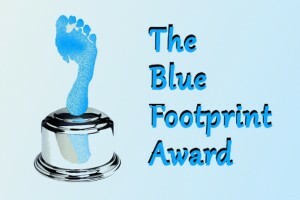 NB The Blue Footprint Award is a very prestigious certificate (not a trophy). It will only be awarded to the most deserving fundraisers.